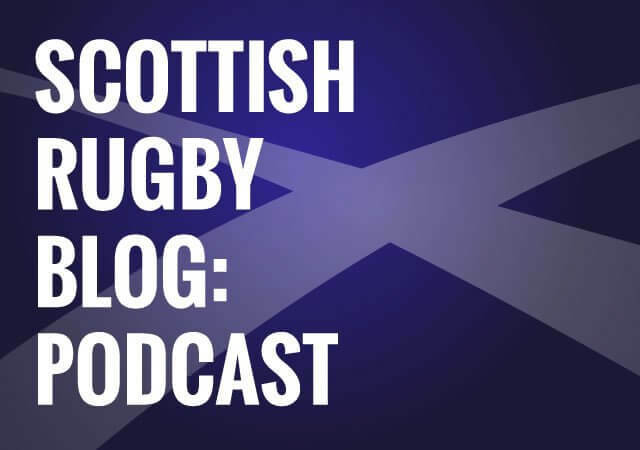 This week Cammy is joined by Iain Hay fresh from BT Murrayfield to look back at Scotland’s mildly convincing win against Italy. We wax lyrical about Sam Johnson and The King before unpacking Scotland’s collapse in the closing 10 minutes. We also analyse the opening round of our Six Nations Fantasy League (https://www.superbru.com/sixnationsfantasy/pool.php?p=11963487), hear about one listener’s attempt NOT to stalk a Scotland International and Cammy tries to sell Iain on jazz bagpipes. Sorry, not listened to the pod yet (that’s for work tomorrow), but does Elliot Daly’s signing imply that Duncan ‘Super’ Taylor isn’t likely to be back? Not sure I agree about Harris being at fault for those Italy tries. For the second try, he takes his man out well. Sure, it would have been even better if he’d managed to prevent the offload, but I think the defender who could have done more was Hogg (who was phenomenal overall). Hogg’s normally outstanding at anticipating the pass/offload and getting between the opposition carrier and the support runner. Instead, he didn’t trust Harris to make the tackle so had eyes on the carrier instead of the support runner. With his pace, he should have had no difficulty getting in between the Italians. For the third try, again Harris took down his man at the side of the ruck, and again another Scottish player (Hastings this time) didn’t trust him to make the tackle, so was sucked into tackling the same player as Harris. Having done this, at the very least Hastings needed to tackle the Italian in a way that prevented the offload. He didn’t, the ball was offloaded and Italy were away down the flank. Seymour was nowhere to be seen because he’d been taken out (arguably illegally well beyond the ruck?) so the flank was exposed. Listening now, total agree with the chat about injuries/wanting to beat the best team possible! And, with the exception of a couple of dirtbags like Huget, celebrating injuries is not only poor form, it’s borderline sociopathy. Also, on the dominant tackles: they’re great for stopping attack because they mean that your defence isn’t continually retreating and reforming, and England were largely double-teaming in order to get dominance. Enjoying the podcast again. Just one wee thing. Maybe I’m A-Typical, but the idea that club level guys won’t want to play national leagues because there’s not going to be any money in it just doesn’t ring true for me. I’m a veteran of over 12 years in the national leagues and haven’t received a penny in remuneration. In fact I’ve paid to play rugby (subs, match fees, bus fares, equipment) and as for incidental benefits no one at my club has ever had anything more than a pie and a beer after the game. At some clubs you might get some kit to train in but the cash is thin on the ground in clubland. It’s a great idea to stop player payments in the lower leagues, more cash can now go into better facilities and into youth development rather than being wasted on journeymen players to push clubs with delusions of grandeur. That only ever works for a wee while anyway and with the backing of a benefactor. When the money stops coming they tumble back down the leagues. Clubs have to grow their own. Look at the unglamourous clubs where many of the top Scottish players cut their teeth (Finn @ Alloa, Dunbar @ Annan, Bennett @ Garnock, Duncy Weir @ Cambuslang, Jonny Gray @ East Kilbride) so for me it’s important these clubs survive and continue to give playing opportunities. Turning them away from wasting money on player payments is a positive. Thanks for the comment Eddy. Great to get some insight from someone that’s played in National Leagues for so long. I completely agree with you and I know not every club pays its players. The point I was trying to make (clumsily) is that regional competitions at a level below the Prem would probably result in higher participation numbers as players wouldn’t be travelling far of a weekend so there’s not a time commitment to travelling long distances. Appreciate others might have a different take and I’m keen to have a podcast about this after 6 Nations. Maybe a round table sort of thing with a few players and clubs. Thanks Cammy, I think you’re right, some people don’t want to travel too far to play, but regionalisation as it stands doesn’t always cut down the travel time. Lanarkshire teams visiting Oban or Wigtonshire for instance is a long journey within the West Region and you’ll note that Caledonia is even further a lot of the time. Whereas what actually ends up happening in national leagues is that the teams who can draw on a bigger populace prosper, lots from central belt and other cities so a lot of the time the actual journey times aren’t as long. There are the outliers though, like Orkney and Caithness which are real undertakings to get to. I think Cammy is abit nostalgic about certain players, and has sentiment about others. Gray is a lump who offers nothing in attack and an average defender based on the lack of dominant tackles, Toolis offers more in the lineout and scrum. Is it a coincidence that as soon as Wilson went off and Turncoat came on that we started to rapidly concede points ? i think not, an average club player at best who people get behind based on ‘those comments’. Harris is the same, i personally thought he was decent this week but after reviewing his defense, is back down to a average club player, should be nowhere near the squad. I do question wether this is an intentional and continuous troll from Mr Black to generate conversation on the blog. Or he could just be calling it how he sees it? We both contributed to the player ratings piece. On the Gray thing i am genuine, the way Scotland are defending atm allows for good scramble defense which means the need for first up tackles is not as important as a rush defense style (look at the way crusaders defend) , the effect a strong dominating tackle can have can disrupt an attacking teams flow, and can provide a big morale boost for the defense, Gray while very technically strong in defense has no niggle and no power which will stop the opposition breaking the gainline, perhaps he is more valuable for Glasgow than Scotland. The partnership Toolis and Gilchrist has is more valuable for this Scotland team i believe as we have often had issues at the lineout in particular. For me Gray is only ahead of Toolis when he is partnered by Gray Snr or Skinner, But because Gilchrist is in good form Toolis is a better fit, i believe club combinations have an advantage in those types of positions. Would be curious on others peoples thoughts on this but perhaps Gray would be better getting some Gametime as a 6 for Glasgow and then transition that into the Scotland team after this World Cup. I’ll indulge you this once on assumption you’re making genuine points. 1) Jonny Gray is perfectly capable of making “dominant tackles” https://youtu.be/HYDbm0unpAI He did it against England last year where Scotland had a clear tactic to come at England and disrupt their attack. He made 24 tackles that day and missed 1. 2) This idea of “dominant tackles” is just a buzz stat. It’s meaningless unless it’s put in the context of how a team went out to play. Not everyone will go out with a plan to make those sorts of tackles and whilst it might work for one team it doesn’t work for all. Admittedly it worked for England at weekend and Scotland at Calcutta Cup but Ireland will be expecting it so Scotland can not rely on that solely as a defensive tactic. Good attack coaches will quickly suss out how to get around it. 3) Toolis attempted 6 tackles at the weekend and missed 3. Got away with it against Italy but you can’t have a 50% tackle rate against the likes of Ireland. One lock will tend to make a lot less tackles than the other. Against Englabd last year Gilchrist made 7 to Grays 24 but he only missed 1. That’s down to where he’s put in defensive line rather than lack of effort. You could argue Finn’s already signalled his intent to solve #2 by getting it wide quickly (in France and here) and chipping in behind to keep the defence honest. While J.Gray is capable of making dominant tackles, there is a difference between doing it once every 2 years and being consistently good at it, toolis may have missed some tackles but England missed alot of tackles against Ireland ‘around 15’ i think, so its not the be all and end all. Thank you for indulging me btw i look forward to be indulged more by you. Seems to be ignorance around the roles that a lock pairing perform. Toolis was scrummaging behind Nel where your stronger scrummaging lock goes due to pressure on the tighthead prop. Toolis is so often written off as the lineout lock but he’s criminally undervalued in the tight by fans where he does so much unseen graft with that being one example. He plays tighthead lock in an Edinburgh pack that dominates most opposition. Toolis grunt and graft in the tight and lineout ability allow Gilchrist to do what he does. Another thing i forgot to mention is the support for Seymour who has been average in every game for the last 2 years bar one game, Maitland is a far more superior player and more defensively solid, he also works as a far better link player. In my humble opinion at least, the Back 3 should be 11. Maitland 14. Kinghorn and 15. Hogg with 23. Graham. I don’t think there is anything wrong with the dominant tackle stat. It gives more information than just tackles completed if those tackles are weak. I accept the way it’s used comes down to interpretation and also the type of tackle that is intended, but for a long time some players have been dining out on their tackle stats when they haven’t necessarily been all that effective. Maybe there’s a better description – Effective tackle or something – that covers good tackles in more circumstances? Also, if Cammy’s source is right, I am not surprised Seymour and Maitland are starting (although I really think Kinghorn deserves it more than Seymour at the moment) – there is an argument for having a player coming back from injury starting and replacing him if he is struggling over having them come on as a sub then not managing and leaving you without specialist cover. Seymour really needs a standout performance soon (as do a couple of other players) or he needs to be demoted to a backup role. Looking back at the match Seymour was more than effective but it was quietly so. He had some good bursts in attack but was solid throughout in defence. Even the way he runs back to block the offload or pass is class. I think he did better than we imagine on Saturday. But dropping Kinghorn rather than Seymour is not the right decision based on Saturday. Solid in defence? Two tries were down his channel. I’ll look again at the end of the match but the last minutes I see as a collective issue and not doing well with 14 men a team issue and perhaps a coaching issue. That fall off I don’t think will happen this week. We have too much experience on the bench and in the 15. If Kinghorn is dropped for Maitland (when it should be Seymour) it sends out all the wrong messages to all players. Score a hat-trick, make 12 tackles (0 missed) , safe under the high ball – be 6Ns player of the week. Enjoyed the pod as usual, but jeez Cammy, jazz bagpipes will haunt my dreams for a while! Yes it was a horrendously rubbish out of tune bagpipe he was playing. I’m sure had he had a pipe in tune it would have been quite fun. How on Earth has that been allowed to be a published work? Incredible. But I suppose when I ask for extras it could be anything and I wouldn’t want this to stop the creative process.